Subway Station Destroyed On 9/11 Reopens [VIDEO] - Joe.My.God. 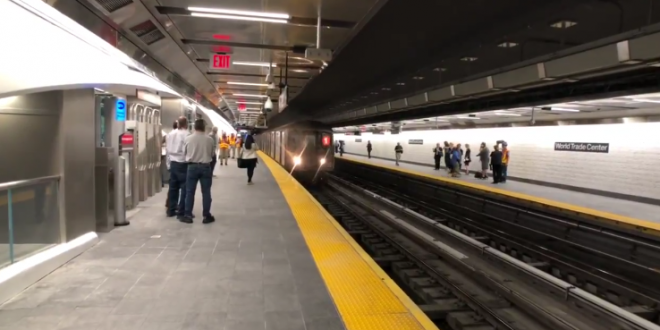 For the first time since the September 11th terror attacks 17 years ago, a 1 train pulled into a previously destroyed subway station at the World Trade Center. The new World Trade Center Cortlandt station is now complete. It is fully accessible and has digital, state of the art real-time train schedules. On Friday, MTA contractors were pulling their equipment out of the station, after 17 years of shuttling commuters to South Ferry instead of Cortlandt Street — after 17 years and $158 million, another milestone. The MTA rebuilt 1,200 feet of tunnel and tracks and made significant repairs to the station shell, track tunnels and track infrastructure, which enabled the restoration of 1 line service to the South Ferry terminal. The station’s walls have a white marble mosaic by Ann Hamilton, who incorporated 4,350 square feet of marble tesserae that shows the text from the 1776 Declaration of Independence and the 1948 United Nations Universal Declaration of Human Rights. Called “CHORUS,” subway riders can touched the raised words and interact with the work.